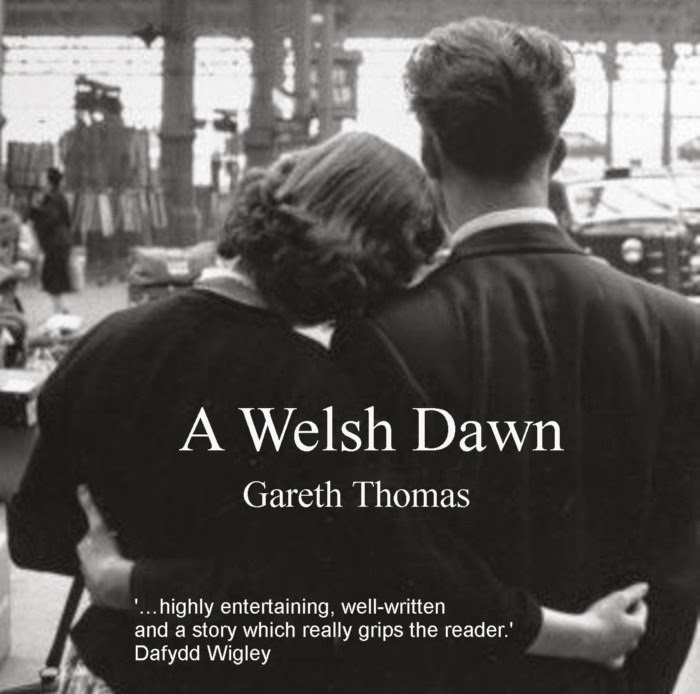 A Welsh Dawn is a novel set between 1956 and 1959. It tells of young love, family tensions, village life, guilty secrets, personal tragedy, Nigerian jazz, dirndl skirts, Welsh nationhood, high ambition, self-sacrifice, duplicity and politics. The politics of the period are dramatised as faithfully as possible: the intrigues of Welsh politicians, the manoeuvring of Downing Street and the machinations of civil service mandarins. These reconstructions provide the backdrop before which the main characters of the novel, Gwen and Ifan, their families and neighbours, live their lives. The late 1950s saw the nadir of Welsh national awareness. Earlier movements for Welsh home rule had been stalled by two successive world wars each demanding that Wales and Scotland sink their identities in the greater British cause. Post- 1945, prominent Labour politicians, notably Aneurin Bevan, believed that differences of language or nationality only weakened the unity of the working class. Movements to assert Welsh identity were resisted. By the late 50s the Welsh language had become associated in the minds of many Welsh people with poverty, suffering and the failing industry of a passing age. The language of prosperity was clearly English. There were few reasons for an aspiring young man to use the Welsh language and, depending on your viewpoint, several against. In the foreground of the story, the principal characters, Ifan and Gwen symbolise the new generation of the 1950’s and 60s. Their generation had a chance to be different and seized it. They were the first of two or three generations not required to fight a European War. They were the first for whom higher education was a real option. They were the first generation to enjoy a global culture : the Plaza Cinema, Penygroes provided ‘rock ‘n roll’ inspiration and role models of rebellious youth. James Dean gave Ifan Jones both attitude and a rockabilly hair style. Pathé news showed him how oppressed groups in Soweto, Alabama and Budapest were challenging the status quo. The chapels started to lose their hold. English accents ceased to inspire deference. We follow Ifan to Bangor University. He had scarcely seen a black face before. Here he forms a friendship with a flamboyant Nigerian musician, Abiola, whose father plays a crucial part in the Nigerian movement for independence. Ifan watches the row grow over Tryweryn. He visits relatives who farm there. He and Gwen join the march through Liverpool to protest at the plans of the Corporation to drown the valley. Ifan is in the gallery of the House of Commons when the Tryweryn debate takes place. He is part of plans to disrupt the visit of Henry Brooke to the 1957 Eisteddfod in Llangefni. We follow him as he looks for answers and strategies. How to make progress in the face of a hostile government who ignore minorities? Is violence ever justified? Are there other forms of protest that can be copied from other movements in other lands? Abiola is on hand to advise. Ifan’s generation faces another dilemma: to move away to find work or to stay in Wales and face a life on the dole? The lure from over the border is strong. One of Gwen’s brothers loses his job when the Ferranti factory in Penygroes closes but is offered work in Coventry. Does he go? Ifan’s mother is desperate for her son to use his degree to escape Dyffryn Nantlle for a safe, clean, well paid profession. Ifan finds himself seduced by the talk and style of some of English girls in Bangor who appear to part of an exiting, enticing cosmopolitan world. London has always been a magnet for young Welsh men in search of excitement and advancement. To go or not to go? What of Gwen? Meanwhile a south Wales English speaking family move into a small Welsh speaking village in Dyffryn Nantlle. The father, a career orientated ex-miner who, having escaped the pits, is now making a career for himself as a white collar manager. Gwilym, their son, joins the local village school where he presents the head teacher with a problem he has long dreaded. The business man does not want his son taught in Welsh. The family will be moving again in three or four years, probably to England so what would be the point? Gwilym becomes an expert in the tensions between the Welsh speaking Welsh and their English speaking fellow countrymen. We share his struggles to survive. We witness the life of the school at good times such as Christmas and at difficult times when tensions bubble to the surface. We follow the headteacher, My Griffiths, as he tries to reconcile his passionate desire to preserve the language he cherishes, with the uncomfortable truth that many of his pupils will be forced to move to Coventry, Birmingham or Derby to find work. NOT teaching them English could be seen as a major disservice to those in his care. Dafydd Williams plays a vital role in the story. A Cofi ( someone born within the wall of the old town of Caernarfon) he is a successful lawyer, a leading figure in the North Wales Labour party and the youngest ever Mayor of Caernarfon. With good reason he appears in the story as a force for change and hope. Like many others he suppressed his nationalist instincts believing he could do far more for the people of Caernarfon and Wales from inside the Labour Party than inside Plaid Cymru. Economic progress had to come first. ‘It’s no use talking to a quarryman from Talysarn about culture when he can scarcely earn a living and his children can’t find jobs. We’ve got to fix the economy first. Give people a bit of business confidence and they will find the pride to defend those things that make Wales what it is.’ He was a ‘ficsiwr’: a man who prided himself on his ability to make things happen. His philosophy was simple: whatever was good for the people of Arfon and Dyffryn Nantle. Dafydd was a fine speaker. He had a beautiful talented wife and two beautiful daughters. He was loved and envied and had vision. There was touch of Camelot about the Williams family. What could possibly go wrong? A Welsh Dawn is a novel about the tensions that existed in Welsh society in the 1950’s: between Welsh and English speaking Wales, between North and South, between those who wanted to preserve their heritage and those who wanted prosperity at any cost, between constitutionalists and those who believed in direct action, between those who longed for a strong Welsh government and those who preferred to lose their Welsh identity within a British state. I am really looking forward to reading this novel! It sounds like it will be an exhilarating and edifying read!